Downloadable as a PSD file or PNG file, choose whichever you like, though PSD helps to fill out the pelt information. Please fill every aspect of this application out. 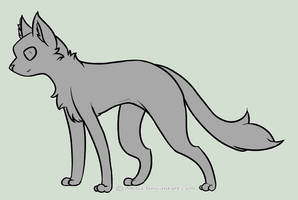 Please be sure to show the character's marking either on the front/back pelt design, headshot, or body pose. GENDER> Male ( Tom ) or Female ( She~cat ) ? RANK> Just put the desired rank of your character. MATE> Fill in the desired circle of your character. SIZE COMPARISON> Not many cats over the size of an average male will be accepted. 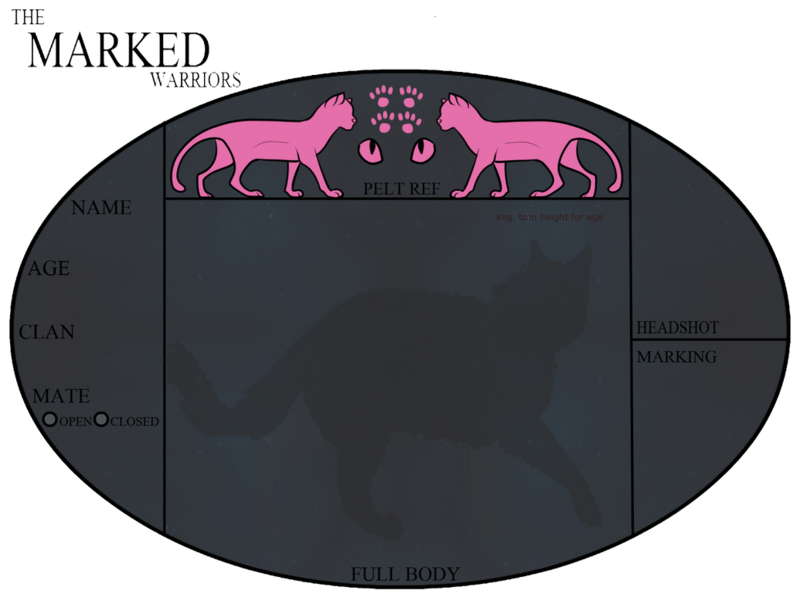 PELT> This is a very important part of your character's design; if not filled out, your character will not be accepted, as it would be vital for others to use this when drawing your character. HEADSHOT> The box overlaying the pelt box is used for a headshot of your character. Seeing as we are a literate roleplaygame group, it is expected for your character to have an organized application, including the following. You are indeed allowed to become creative with this and add more to it/change the layout of the written form of your application! Just be sure to have what is required. Know that we ABSOLUTELY LOVE when people are overachievers and do more than what we ask for when it comes to written information! We like to be able to scroll through things for a while and see how well-developed your cat is! Use as many symbols/bullets/colors as you want. 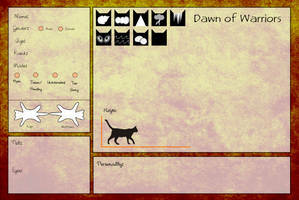 Credit to the pelt design bases and the average male cat height silhouette goes to =fallen-kitty! Credit to the rest of the application goes to ~faifers! i have a twisted wrist, the doctor said it needs until end of may to heal fully, so could i use lineart and change it later? Ok. Well, i'll just use the picture my friend dose for my request. could I like draw the body and use lineart fo legs, because I cannot do legs unless you count chopsticks as legs.. It won't cause a problem, but we do need your character on the application .. It needs to be drawn on the application, though .. Oh...I'll see what I can do. Owlfoot can get cocky in battle, showing of to his Clanmates about how strong he is compared to the enemy. A downside to the trait, but there is an upside. He speaks up for what he believes in, so that he makes sure everyone gets a say in whatever the topic is. Although he's small, he is a pretty tough cat. Owlfoot always figures out a way, thus his motto "When there's a will, there's a way." He analyzes the battlefield and matches up opponents. When he finds his, he dashes into battle and attacks relentlessly. Owlfoot always does his best to make sure he uses his cleverness. If Owlfoot ever needs to, he can talk his way out of a battle. Along with slyness comes the ability to be stealthy. He can sneak around and blend his fur in with the environment. Being sly also makes him a good Hunter. As a kit, Owlfoot was always tough on the other kits. When they play fought, Owlfoot would devise a way to completely defeat them. However, he was still polite and offered advice on how to fight better. Owlfoot always liked to sit in a quiet spot and groom himself, thinking of better ways to defeat his opponents. Little did he know that while doing that, it would make him a marvelous warrior. As an apprentice, Owlfoot would be obedient to his mentor. He would watch the moves performed and execute them almost perfectly. Problem is, he thought that doing things other than training were a waste of time, so he complained every time. Owlfoot eventually got over it though. When Owlfoot became a warrior, he practiced every day for when his first battle came. He would fulfill any task given to him, maybe a few complaints on some boring tasks. Owlfoot sharpens his claws on trees because they are small, hoping they will grow if sharpened. However, size doesn't matter when it comes to Owlfoot (except for his claws). Owlfoot finds a way to put humor in his size. Owlfoot padded to the lake and dropped to a crouch. The wind ruffled his brown fur. The silver moon reflected off of his golden amber eyes. He reached one fluffy paw out and touched the cool surface, ripples breaking through like glass. Owlfoot's parched tongue hit the cool surface of the water. For the most part, Owlfoot is a patient guy. If another cat doesn't do something fast, Owlfoot will wait a bit before politely asking to hurry it up. Problem is, if something happens to someone he's good friends with, he's a flurry of rage. For sibling can we just make something up if their not in the group? Sure, if you'd like. You could also make an NPC character or have tryouts for someone to roleplay the sibling(s) of you want. do you have a paint tool sai version? No, I'm sorry. :c It should still work, though! Is it alright if I use my own Lineart? I'm having trouble drawing correctly on MS Paint and a mouse ._. If you did an application for the old group, would you have to do this one, too?